1 E None No Power Seat 1 E is a standard Business Class Bulkhead seat. 10 A None No Power Seat 10 A is an Economy Class Bulkhead seat whose proximity to the galleys may be bothersome. The tray tables are in the armrests, making the armrests immovable and slightly reducing seat width. There is no floor storage during takeoff and landing. 10 B None No Power Seat 10 B is an Economy Class Bulkhead seat whose proximity to the galleys may be bothersome. The tray tables are in the armrests, making the armrests immovable and slightly reducing seat width. There is no floor storage during takeoff and landing. 10 D None No Power Seat 10 D is an Economy Class Bulkhead seat whose proximity to the galleys may be bothersome. The tray tables are in the armrests, making the armrests immovable and slightly reducing seat width. There is no floor storage during takeoff and landing. 10 E None No Power Seat 10 E is an Economy Class Bulkhead seat whose proximity to the galleys may be bothersome. The tray tables are in the armrests, making the armrests immovable and slightly reducing seat width. There is no floor storage during takeoff and landing. 10 F None No Power Seat 10 F is an Economy Class Bulkhead seat whose proximity to the galleys may be bothersome. The tray tables are in the armrests, making the armrests immovable and slightly reducing seat width. There is no floor storage during takeoff and landing. 10 G None No Power Seat 10 G is an Economy Class Bulkhead seat whose proximity to the galleys may be bothersome. The tray tables are in the armrests, making the armrests immovable and slightly reducing seat width. There is no floor storage during takeoff and landing. 10 K None No Power Seat 10 K is an Economy Class Bulkhead seat whose proximity to the galleys may be bothersome. The tray tables are in the armrests, making the armrests immovable and slightly reducing seat width. There is no floor storage during takeoff and landing. 10 L None No Power Seat 10 L is an Economy Class Bulkhead seat whose proximity to the galleys may be bothersome. The tray tables are in the armrests, making the armrests immovable and slightly reducing seat width. There is no floor storage during takeoff and landing. 11 L None No Power Seat 11 L is a standard Economy Class seat. 2 A None No Power Seat 2 A is a standard Business Class Bulkhead seat. 2 B None No Power Seat 2 B is a standard Business Class Bulkhead seat. 2 K None No Power Seat 2 K is a standard Business Class Bulkhead seat. 2 L None No Power Seat 2 L is a standard Business Class Bulkhead seat. 27 D None No Power Seat 27 D is an Economy Class seat that may have limited recline. The close proximity to the lavatories may be bothersome. 27 E None No Power Seat 27 E is an Economy Class seat that may have limited recline. The close proximity to the lavatories may be bothersome. 27 F None No Power Seat 27 F is an Economy Class seat that may have limited recline. The close proximity to the lavatories may be bothersome. 27 G None No Power Seat 27 G is an Economy Class seat that may have limited recline. The close proximity to the lavatories may be bothersome. 28 A None No Power Seat 28 A is an Economy Class seat that may have limited recline. The close proximity to the lavatories may be bothersome. 28 B None No Power Seat 28 B is an Economy Class seat that may have limited recline. The close proximity to the lavatories may be bothersome. 28 K None No Power Seat 28 K is an Economy Class seat that may have limited recline. The close proximity to the lavatories may be bothersome. 28 L None No Power Seat 28 L is an Economy Class seat that may have limited recline. The close proximity to the lavatories may be bothersome. 30 D None No Power Seat 30 D is an Economy Class Exit Row seat that may have extra legroom, however the close proximity to the lavatories may be bothersome as people tend to congregate in this area. The tray table is in the armrest, making the armrest immovable and slightly reducing seat width. There may be no floor storage during take-off and landing. 30 E None No Power Seat 30 E is an Economy Class Exit Row seat that may have extra legroom, however the close proximity to the lavatories may be bothersome as people tend to congregate in this area. The tray table is in the armrest, making the armrest immovable and slightly reducing seat width. There may be no floor storage during take-off and landing. 30 F None No Power Seat 30 F is an Economy Class Exit Row seat that may have extra legroom, however the close proximity to the lavatories may be bothersome as people tend to congregate in this area. The tray table is in the armrest, making the armrest immovable and slightly reducing seat width. There may be no floor storage during take-off and landing. 30 G None No Power Seat 30 G is an Economy Class Exit Row seat that may have extra legroom, however the close proximity to the lavatories may be bothersome as people tend to congregate in this area. The tray table is in the armrest, making the armrest immovable and slightly reducing seat width. There may be no floor storage during take-off and landing. 31 A None No Power Seat 31 A is an Economy Class Exit Row seat that may have extra legroom, however the close proximity to the lavatories may be bothersome as people tend to congregate in this area. The tray table is in the armrest, making the armrest immovable and slightly reducing seat width. There may be no floor storage during take-off and landing. 31 B None No Power Seat 31 B is an Economy Class Exit Row seat that may have extra legroom, however the close proximity to the lavatories may be bothersome as people tend to congregate in this area. The tray table is in the armrest, making the armrest immovable and slightly reducing seat width. There may be no floor storage during take-off and landing. 31 K None No Power Seat 31 K is an Economy Class Exit Row seat that may have extra legroom, however the close proximity to the lavatories may be bothersome as people tend to congregate in this area. The tray table is in the armrest, making the armrest immovable and slightly reducing seat width. There may be no floor storage during take-off and landing. 31 L None No Power Seat 31 L is an Economy Class Exit Row seat that may have extra legroom, however the close proximity to the lavatories may be bothersome as people tend to congregate in this area. The tray table is in the armrest, making the armrest immovable and slightly reducing seat width. There may be no floor storage during take-off and landing. 42 D None No Power Seat 42 D is an Economy Class seat that may often be bumped into by service carts or others passing by as it juts out into the aisle. 42 G None No Power Seat 42 G is an Economy Class seat that may often be bumped into by service carts or others passing by as it juts out into the aisle. 43 D None No Power Seat 43 D is an Economy Class seat that may have restricted legroom as it is misaligned with the seats in front due to the awkward transition from four seats ahead to three seats. 43 E None No Power Seat 43 E is an Economy Class seat that may have restricted legroom as it is misaligned with the seats in front due to the awkward transition from four seats ahead to three seats. 43 F None No Power Seat 43 F is an Economy Class seat that may have restricted legroom as it is misaligned with the seats in front due to the awkward transition from four seats ahead to three seats. 45 A None No Power Seat 45 A is an Economy Class seat in the last row of the plane. The close proximity to the galleys and lavatory may be bothersome. 45 B None No Power Seat 45 B is an Economy Class seat in the last row of the plane. The close proximity to the galleys and lavatory may be bothersome. 45 K None No Power Seat 45 K is an Economy Class seat in the last row of the plane. The close proximity to the galleys and lavatory may be bothersome. 45 L None No Power Seat 45 L is an Economy Class seat in the last row of the plane. The close proximity to the galleys and lavatory may be bothersome. 46 D None No Power Seat 46 D is an Economy Class seat in the last row of the plane. This seat may have limited or no recline and the close proximity to the galleys and lavatory may be bothersome. 46 E None No Power Seat 46 E is an Economy Class seat in the last row of the plane. This seat may have limited or no recline and the close proximity to the galleys and lavatory may be bothersome. 46 F None No Power Seat 46 F is an Economy Class seat in the last row of the plane. This seat may have limited or no recline and the close proximity to the galleys and lavatory may be bothersome. 5 B None No Power Seat 5 B is a standard Business Class seat. 6 A None No Power Seat 6 A is a Business Class seat where the close proximity to the lavatories and galley behind may be bothersome. 6 B None No Power Seat 6 B is a Business Class seat where the close proximity to the lavatories and galley behind may be bothersome. 6 D None No Power Seat 6 D is a Business Class seat where the close proximity to the lavatories and galley behind may be bothersome. 6 E None No Power Seat 6 E is a Business Class seat where the close proximity to the lavatories and galley behind may be bothersome. 6 K None No Power Seat 6 K is a Business Class seat where the close proximity to the lavatories and galley behind may be bothersome. 6 L None No Power Seat 6 L is a Business Class seat where the close proximity to the lavatories and galley behind may be bothersome. Business Class features the "RAVE" Entertainment system with a 12" HD touch screen at each seat, with a remote control for each individual. Economy Class also features individual entertainment systems with 9" screens. Popular music is available in addition to Tahiti radio. Business Class features the "RAVE" Entertainment system with a 12" HD touch screen at each seat, with a remote control for each individual. 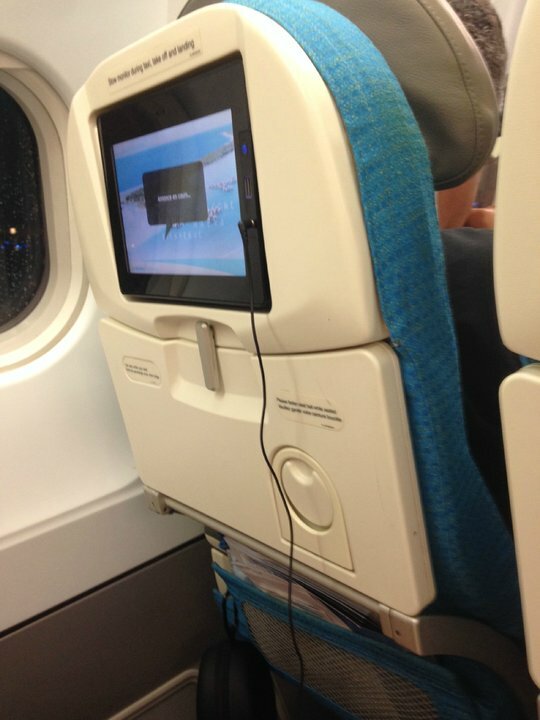 Economy Class also features individual entertainment systems with 9" screens. Up to 14 movies and 24 TV programs are available on demand. Business Class has individual power ports available at each seat. Economy Class does not have power ports. For all classes, special meals are available for medical or religious reasons if requested 36 prior to the flight. Complimentary food and beverage is available in all classes. 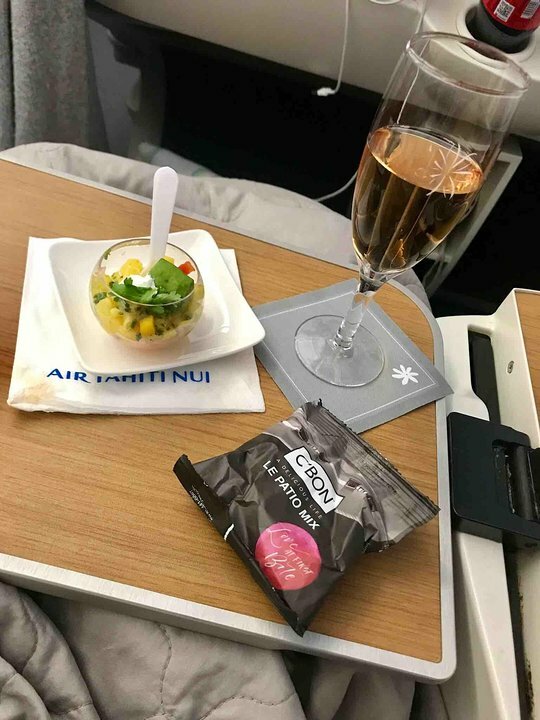 Air Tahiti Nui reconfigured their A340-300 aircraft by removing First Class, and now operates with a two class configuration of Business and Economy Class. Business Class features 30 angle lie flat seats with fully adjustable head and leg rests. Economy Class has 264 standard seats in a 2-4-2 configuration. The armrests between seats E and F are fixed. All other armrests on this aircraft can be raised. There are no individual air nozzles. There is a 2-3 inch gap between the window seats and the wall, making it difficult to lean on the window. Absolutely HORRIBLE Business Class Seats. Terribly outdated. Seats are from the 1990s. Avoid paying overly expensive prices for these seats! Very uncomfortable. Do not lay flat. No power. Falling apart. Video monitor is a joke! Thank god ATN is buying new planes. These A340 are showing their age. Fabric on the seats have tears, plastic on the seats are cracked. The interior has not been replaced for 20 odd years. Fairly poor value when considering ATN is 2x the cost for comparable 2 hour flights. This is a good seat. Good legroom (I am 6'4". Mildly limited foot room due to bulkhead but much better than other seats. Row 31 has more legroom but 31A has a bulging aircraft door in the way. 31 A/B are cold with 10A/B warm Check-in people in Papeete were very nice and 36 hr online check-in prior to flight is HIGHLY recommended. You get a better seat and a different check-in line in Papeete. Plane needs replacing...787's are on order. 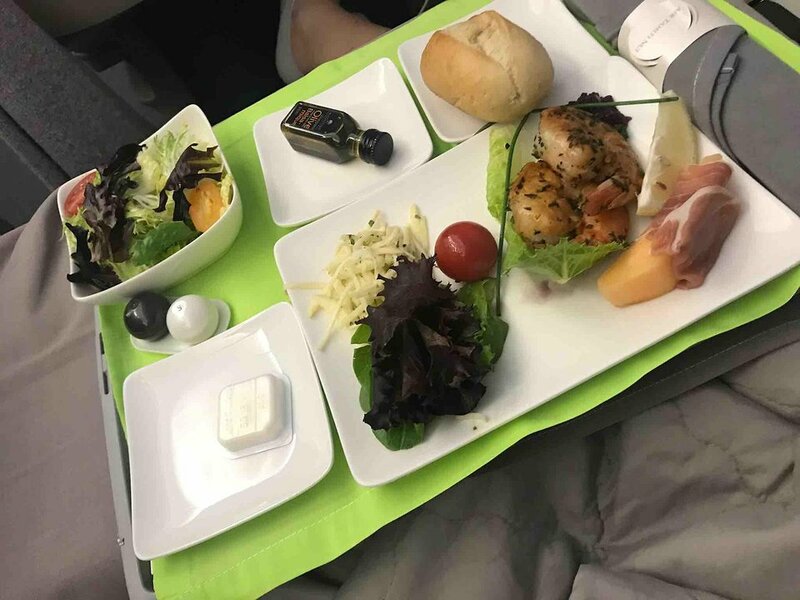 Food was average compared to US airlines and worse than European or Asian airlines. Great seat near the galley and restroom, plus a wider aisle. We flew LAX-PPT in seats 3A/B on 4 Oct and seats 4A/B Pfrom PPT-LAX on 19 Oct. These are the worst business class seats we've ever had. The space is nice and the screen is pretty good. But the seats are uncomfortable, clunky to maneuver, and hard as bricks when laying flat. Air Tahiti is the only game in town (except for Air France) and they really should upgrade these seats yo ones that aren't back-breakng. I was unfortunately on one of the old style business class planes. It was horrid. Air Tahiti Nui has 2 still with the old configuration and it is not apparent which one you will get at the time of booking. The footrest was broken, the tv would not work, and the tray table had to be supported by raising my knees about 2 cm. I was extremely uncomfortable for the entire flight. Thankfully, I was only going AKL-PPT. I felt sorry for those continuing on to LAX. LAX-PPT in 4K, PPT-LAX in 5E. Business class on this airplane is mediocre, but for a trip to the islands in Business class I can't really complain. both flights were over night, so I slept through most of them. Seats are a bit uncomfortable for people who sleep on their sides, but they do the job. Crew was great, and the two breakfast I had were good, thought LAX catering I think is a bit better than that in PPT. No legroom, there is equipment on bottom of seat 31A completely preventing extension of your legs under the seat. On my flight 2/5/16, the seat was broken and would NOT recline; attendant couldn't fix so I was fully upright the entire "red-eye" flight! We flew business class in September of 2015 from LAX to PPT. We were in an older version of the plane -- it still had the separate first class. I wonder if there are other planes that have not been updated, or if we were "lucky" enough to pay for an upgrade on the only remaining older configuration. 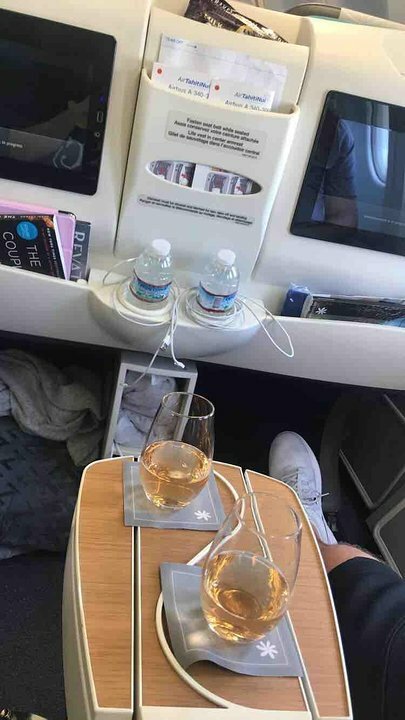 The business seats are really not that bad. It's no Emirates, but for an airline to the islands it is fine. There is a good enough recline to sleep, the tv's are big, and the service was very good. After one good experience (27A) I was allocated 45A on next trip. As shown on map it was a 'bad seat': excessive noise from cabin crew getting out blankets from lockers above, light from galley storage cupboard, noise from attempts to use empty soap container and being easily overlooked by cabin crew. These seats are typical slim line seats that are great for couples. My wife and I are 5'6" and these seats felt snug. They are good for people our size, however I can not imagine a 6'4" individual sitting comfortable for 8+ hrs in these seats. The food quality flying from LAX-PPT was delicious and tasty and the food quality flying PPT-LAX was not so good. The overhead bin on this side of the plane was only big enough to hold our smaller carry-on as we had to use the middle overhead bin to hold our regular sized carry-on. If upgrading ahead of time is not more than $400 each way, do it! Btw, the service on this aircraft is Excellent!!! We have flown this aircraft to Paris, LAX, and Tahiti. The Service has been Excellent each time! I have flown on everything from a DC-3 to a B-52 (ejection seat) and the seats on this are by far the worst. Seats turn to rocks after 1 hour. Air Tahiti Nui needs a new tape measure. The seat pitch in economy is not 33". Service was OK, but check in was a nightmare. Agents don't seem to care if you fly with them or not. I waited in line for an hour watching the agents at the counter chit chatting before checking any in. Air Tahiti Nui needs a course on how to run an airline!! The seat above great but it was hard to change the seat position. Entertainment was okay but the only thing I watched was Happy Feet. The food was really delicious for airline food. Out of the 45 different airlines I flew with the food was ranked 12th. The service was amazing. They hand out min ties. Refreshing!!!. Also they had great welcoming music. Most uncomfortable business class experience of my life. Seat was old recliner type seat and foot rest would not come up. FA said it had been broken for a while and they were waiting on parts. Seat 4B had no tray table, passenger had to eat with his tray in his lap. It is unbelievable that they charge thousands of dollars for this! the worst most uncomfortable seat i have ever been in! seats very narrow, no leg room, person in front is in lap when seat is reclined! can't even cross your legs. the seat is even more uncomfortable when seat is reclined. seat has no cushion to it..feels like you are sitting on a rock for 8 hours! 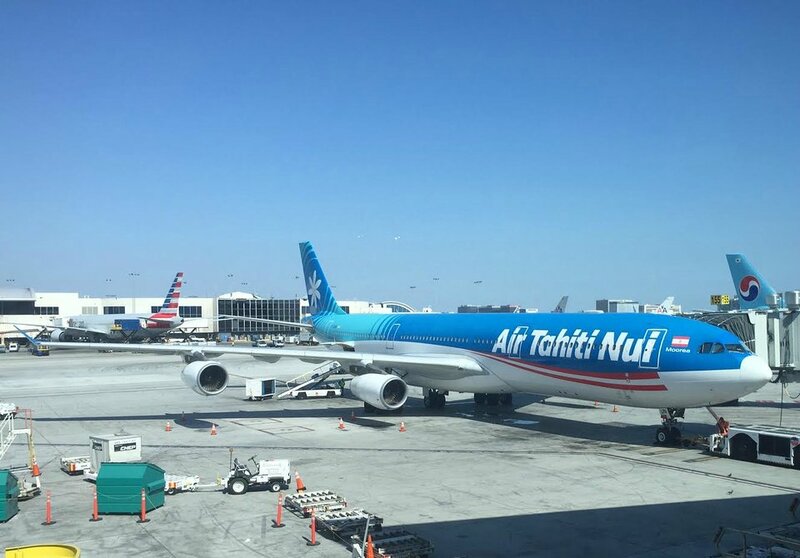 Air Tahiti Nui flies 1 versions of Airbus A340-300.